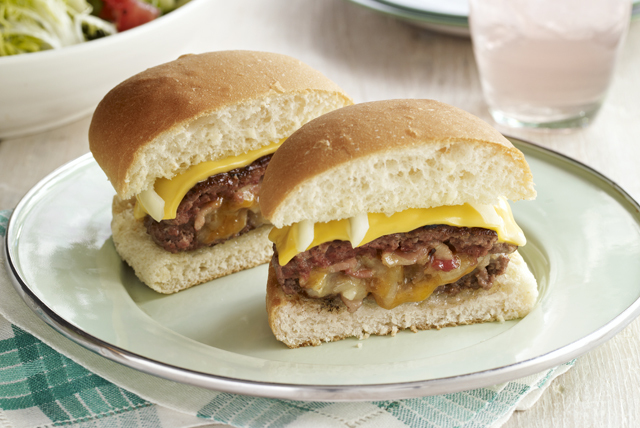 As if cheeseburgers aren't awesome enough, these Stuffed Burgers up the ante with a gooey center of bacon, onion and melted cheese—double cheese, that is. Cook bacon in small skillet until crisp. Meanwhile, cut 4 thin slices from center of onion; finely chop remaining onion. Remove bacon from skillet, reserving 1 Tbsp. drippings in skillet. Drain bacon on paper towels. Add chopped onions to reserved drippings; cook on medium heat 5 to 6 min. or until golden brown, stirring frequently. Remove from heat. Crumble bacon; mix with cooked onions and cheese. Shape meat into 8 thin patties. Top 4 patties with bacon mixture; cover with remaining patties. Pinch edges together to seal. Grill 6 to 7 min. on each side or until done (160ºF); top with Singles. Fill buns with burgers and sliced onions. Save 100 calories and 11 g fat, including 5 g sat fat, per serving by preparing with 2% Milk Singles, lean ground beef, turkey bacon and spraying the pan with cooking spray instead of using bacon drippings. Sliced onions can be grilled with the burgers 2 min. on each side or until tender. The hamburger buns can also be toasted, if desired. Just add to grill, cut-sides down, with the onions; grill 1 min. or until toasted.